Who needs fireworks when the Reserve Bank of Australia (RBA) can fire up the markets just fine? In case you missed it, the central bank just printed that it will keep its 1.50% interest rate steady for another month in July. But that’s not what surprised market players – they already expected no policy changes. 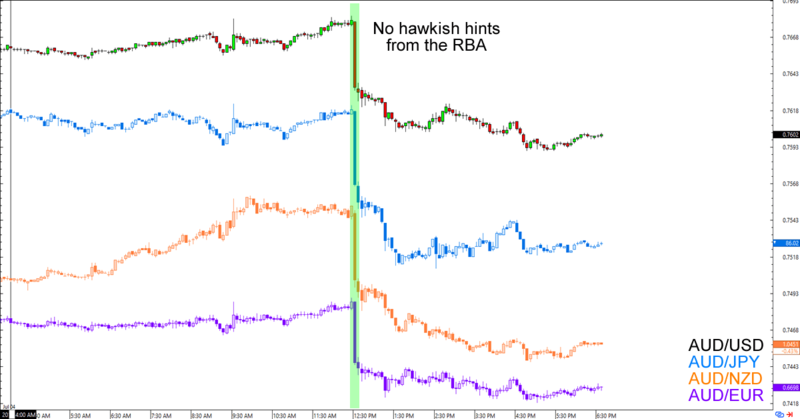 With the European Central Bank (ECB), Bank of England (BOE), and Bank of Canada (BOC) all turning hawkish lately, traders had expected the RBA to join the bandwagon. But it seems like RBA Governor Philip Lowe and his team are immune to such pressures. In fact, they might have taken care NOT to sound hawkish as they refused to highlight the recent improvements in employment. The Aussie took most of the heat, with the high-yielding currency selling off against its major counterparts during the Asian session. Like many major central banks, it seems like the RBA is looking closely at wage growth for its policy direction. See, while stronger employment growth and positive business sentiment are all well and good, it’s higher wages that would pay household debts AND encourage blokes and sheilas to spend their moolah on goods and services. More importantly, it also believes that wage growth “remains low” and will remain low “for a while yet.” Duhn duhn duhn. The central bank didn’t feel any such optimism in July. In its statement, the RBA noted that the slowdown in Q1 2017 growth “partly” reflected temporary factors. On the whole, the RBA’s cautious tones on the outlook for both growth and inflation have encouraged speculations that the central bank will downgrade its forecasts this August. Yikes! One of the more popular reasons for a central bank to raise interest rates is to cool its housing markets. But with regulators forcing Australia’s largest banks to exceed the RBA’s rates, the pressure to tighten has eased. Major Australian banks are concentrating on raising mortgage rates for investors and interest-only borrowers who both fuel indebtedness and property prices, while slashing rates for owner-occupiers and principal-and-interest borrowers. As mentioned in our RBA trading preview yesterday, these regulations seem to be doing the trick. However, many analysts have pointed out that the RBA would likely wait for more evidence that the regulations are working before they make their next steps. So, it looks like the RBA remains firmly in the neutral camp for now despite other central banks hopping over to the hawkish side. Fortunately, we also know that wage growth will likely be key to the RBA’s next steps. Until positive trends in employment translate to higher wages, or until we see enough significant pressure on inflation, Lowe and his team will likely keep their rates steady for a while longer.